PHOTO CAPTION: Georgia resident and professional bass tournament angler Roy Roper held his audience's attention during two seminars at the NMSA's first Outdoor Fun Day Saturday at the Litton Center. His instructions and casting demonstrations were both informative and entertaining. Duck and goose calling as well as retrieving dog demonstrations were also presented, and youth could try their hand at archery. The Chillicothe-based North Missouri Sportsman's Alliance hosted their first-ever Outdoor Fun Day last Saturday at the Litton Center northwest of Chillicothe, and the event drew a large crowd of more than 600 people enjoying a welcome break in the week's inclement weather. The day's outdoor activities and instructional seminars were free to all who came and folks from Chillicothe and throughout the surrounding area showed up in droves. The only activity all day long that required a monetary outlay was the All-You-Can-Eat Fish Fry luncheon prepared by Chillicothe Hy-Vee, and even that was free to attendees age 10 and under. Chef Jeff Frampton was hard-pressed to keep the fish and chicken strips coming out of the cooker fast enough to satisfy a hungry crowd of more than 300 people when lunchtime rolled around. An MDC Hunter Education skills class was offered in the morning so interested students could complete their hunter education certification, which is required for anyone born on or after January 1, 1967, who wants to purchase a Missouri hunting permit. The class was completed under the guidance of Livingston County Conservation Agent Jake Strozewski in plenty of time for students to partake of the fish and chicken and join in the numerous outdoor activities. The Outdoor Fun Day featured classes and clinics from 9AM until after 3PM on a wide variety of hunting and fishing topics, with class leaders who offered "how-to" information based on years of experience in outdoor activities such as bass fishing, deer and turkey hunting, duck and goose calling and working with retrieving dogs, trapping, and Missouri snakes and reptiles. Professional bass tournament angler and Georgia resident Roy Roper, a very popular speaker at NMSA's Outdoor Classics a few years ago, returned to Chillicothe to instruct and entertain young and old attendees while presenting valuable tips of how to catch a variety of fish species. In addition to these clinics, youngsters attending were able to shoot shotguns, air rifles and bows and arrows under the guidance of expert instructors all day long. The excited shouts of laughter that could were heard throughout the fairgrounds all day long were punctuated frequently by the sound of shots as youngsters, many of whom were shooting a gun for the very first time, tried to break a fast moving clay pigeon. You couldn't hear the air rifles being discharged or the arrows being released, but their activity was equally frequent. 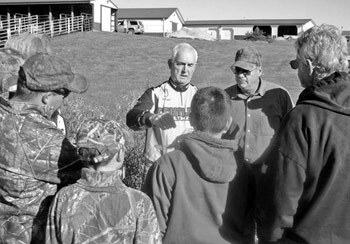 Representatives from the Missouri Department of Conservation and the Chillicothe-based Shortgrass chapter of Quail Forever offered expert guidance and instruction to the young shooters, many of whom were shooting for the very first time. Youngsters attending were also allowed to fish as much as they wanted during the day in the Litton Center's pond, which had recently been additionally stocked for this event. Despite high and muddy water from the recent flooding rains, some pretty good fish were caught. Energetic youngsters had no problem in keeping busy with outdoor activities during the day-long event. The Mervyn Jenkins building on the Litton Center campus was the registration center for the day's activities and also contained tables and exhibits from several vendors who displayed their wares or offered information on a variety of outdoor topics. It was also the Fish Fry luncheon site. With no attendance charge, thus no tickets to count, and attendees scattered all over the Litton Center campus, getting a handle on the number attending was difficult, but the crowd-size was estimated at more than 600. No doubt the beautiful "fall day even though summer's not officially over" cool, crisp weather with bright blue skies and lots of sunshine contributed to the great attendance for this first-time event, but NMSA president Steve Shoot is optimistic that next year's Outdoor Fun Day will attract even more area residents once the word gets around about how much outdoor fun can be had for free at a NMSA Outdoor Fun Day. Kids and the Great Outdoors are just a natural combination that needs a little encouragement now and then and Outdoor Fun Days like this one offer that encouragement. Bring on the next one!